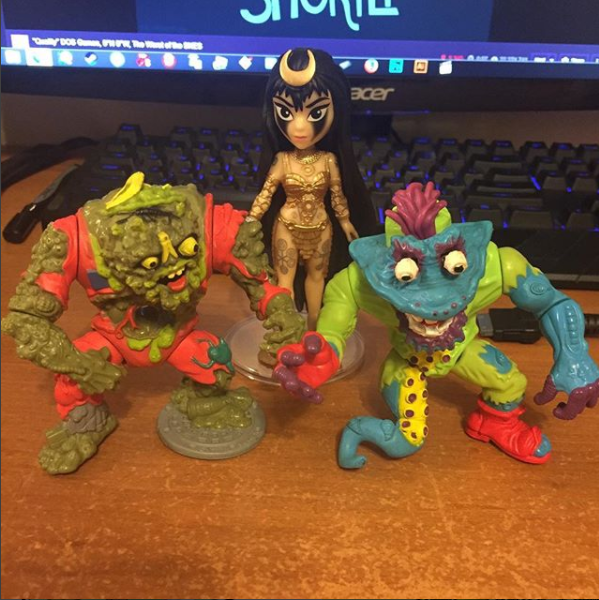 I picked these guys and gal up for $10 a pop at Wal-Mart today. I've never seen them before. Sweet. Might have to check my store for those when I go in to work tomorrow. For anyone interested in these, they're Wal*Mart exclusive. 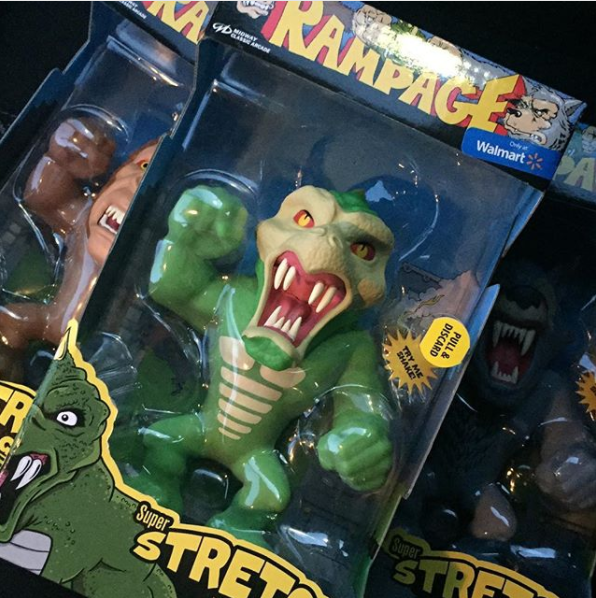 They're not just vinyl figures, they're Stretch Armstrong-like stretchy toys. 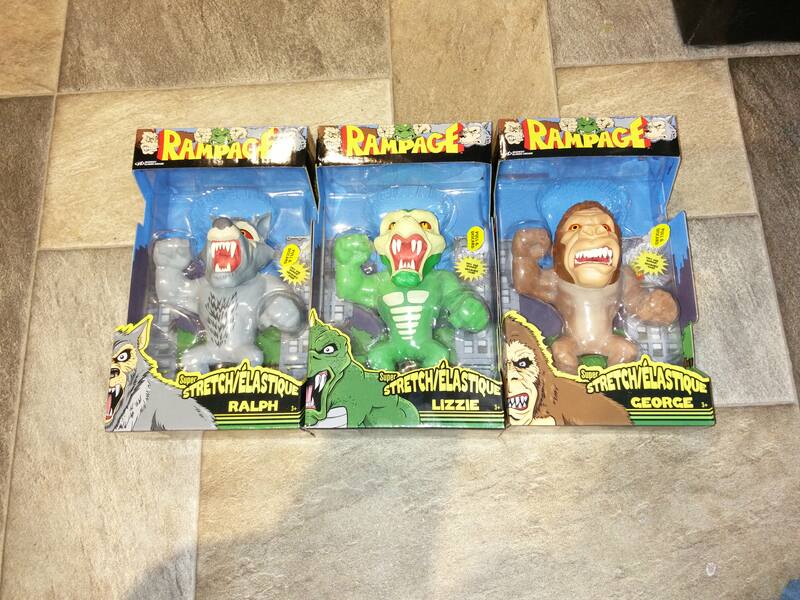 They are the most video game accurate piece of merchandise to come from the Rampage movie marketing blitz. I love Rampage. I will check my Walmart next week to see if they got them. Finally got my ExoSquad toys out of storage and displayed. Went to the Jersey Shore Toy Show which was a relatively small affair but nice. I think I just took my first step into TMNT collecting. Glad to see the last several posts have been offering some variety to the thread with more'n a few non-Transformers scores. 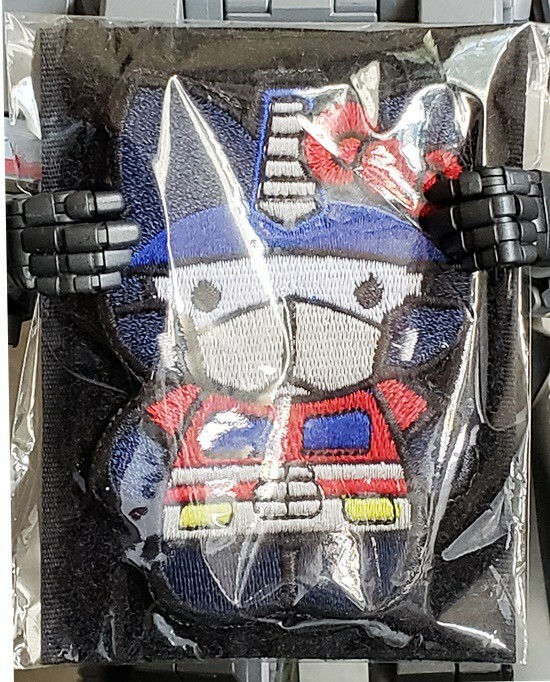 It's a velcro-backed Hello Kitty Optimus Prime patch! Isn't she just t3h ad0rbz?! 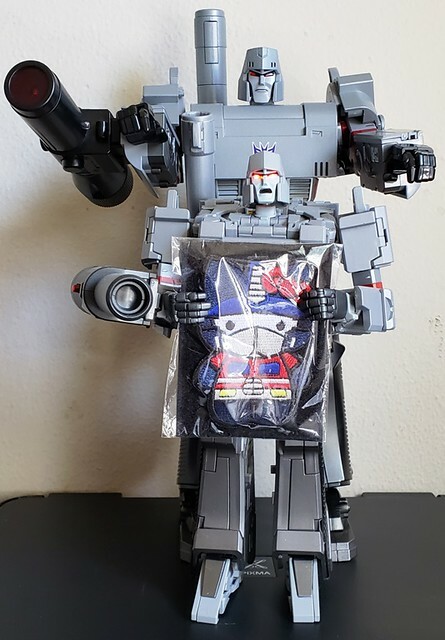 ... a high-end knock-off of MP-36 Masterpiece Megatron with head upgrade! I have a fusion arm-cannon upgrade on order for this fine gentleman, as well as a reprolabels decal sheet to give him a more G1 toy look. But wait-- who's the big guy behind him? 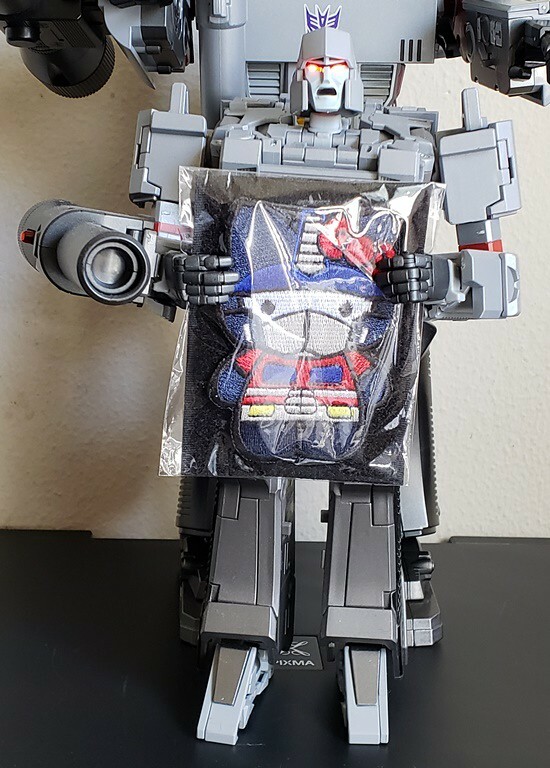 An even more oversized KO of MP10 Optimus that stands about 28" (71 cm) tall in robot mode, and would make a great ride for my RoboCop figure in truck mode. BTW I wonder how much longer 'till they release a 1:1-scale version? And don't even get me started on the trailer accessory for this behemoth. Damn that Prime is huge! Took advantage of the GameStop clearance sale. These were half off the sticker price. 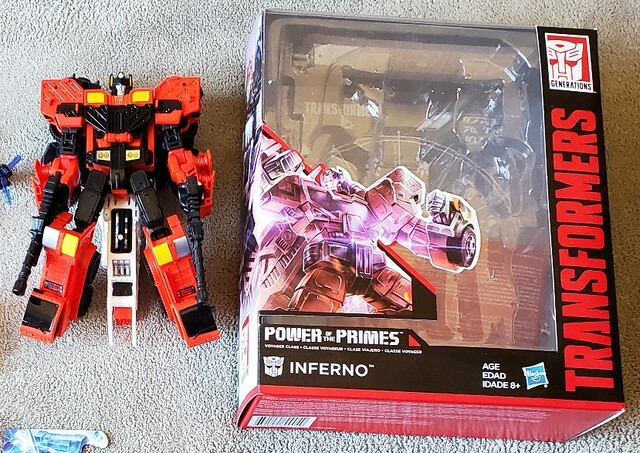 - Power of the Primes Inferno, which is a repaint and slight redeco of Combiner Wars Protectobot Hot Spot. Personally, I prefer Inferno's red-and-black paint job over his predecessor's light-blue-and-red livery. 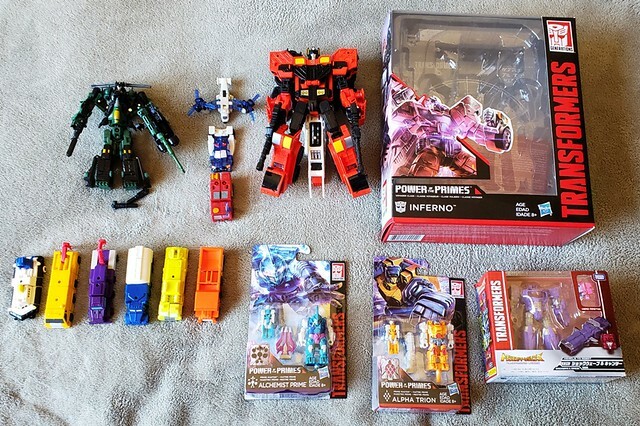 - On the left and the middle are the second wave of PotP Prime Masters figures, tributes to the Pretenders toys that showed up in the late '80s, near the end of the Gen-1 toy run. On the right is a Japanese Transformers Legends Shockwave figure with Cancer headmaster mini-figure. - Above left is Centuritron, the combined form of the Generations series mini-con assault team. Above right is the Armada Emergency mini-con team. 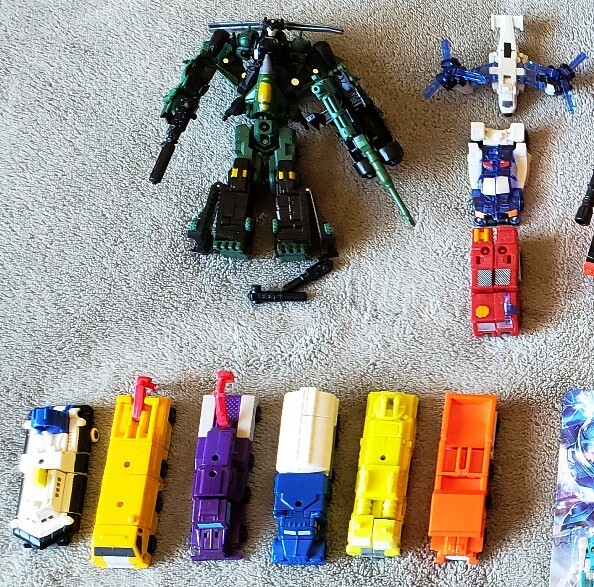 Below are a half-dozen Micromaster combiners, whose front halves and back halves are interchangeable. Each half transforms into its very own robot. As you can see, Mega-Maid wasn't the only TransFormers reference in Spaceballs. These are new/updated versions of the classic Masters of the Universe figures, offered through Super 7. She-Ra is the only figure of those 4, that is an entirely new figure. The other 3, are redeco/repaints. Bugs me how He-mans head is turned completely to the side. Makes me badly want to open it up to spin his head forward! 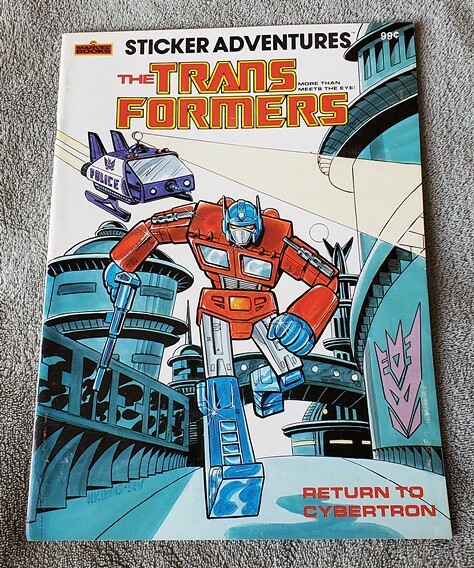 I picked up Starscream today, do you know what other ones have been released? So, for the mini bots, they released: Bumblebee, Swerve, Outback and Tailgate. For the bigger bots, they have released Starscream, and Hot Rod. One thing to note about these reissues. They all have been modified slightly from their original versions. The minibots all have "improved" faces, with additional paint deco.